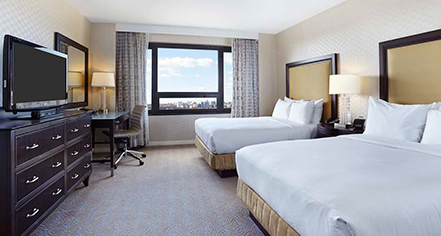 Overlooking the vibrant city of Washington, DC, the 1,070 guestrooms and 47 suites at the historic Washington Hilton feature the comforts of home with the Hilton Serenity Bed paired with luxurious down comforters and modern design to ensure of leisurely stay. Guestrooms - With soothing color palettes and contemporary decoration, these accommodations are available with one king-size or two double-size beds. Suites - The one- and two-bedroom suites offer spacious rooms and luxurious amenities for discerning guests. Executive Rooms - Boasting two double-size beds or one king-size bed, these rooms provide exclusive access to the Executive Lounge on the tenth floor. 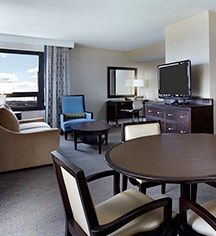 Accessible Rooms - Created to ensure comfort of every guest, accessible rooms feature assertive features in addition to the standard luxury amenities provided at Washington Hilton.